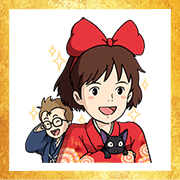 Characters from some of Studio Ghibli’s greatest works gather to ring in 2019 in this omikuji sticker set. This is a sticker debut for some characters! Make it a magical New Year with these timeless classics at your side. Omikuji lasts from December 27, 2018 to January 3, 2019.